I’ve had a bit of a Vichy-fest this week! 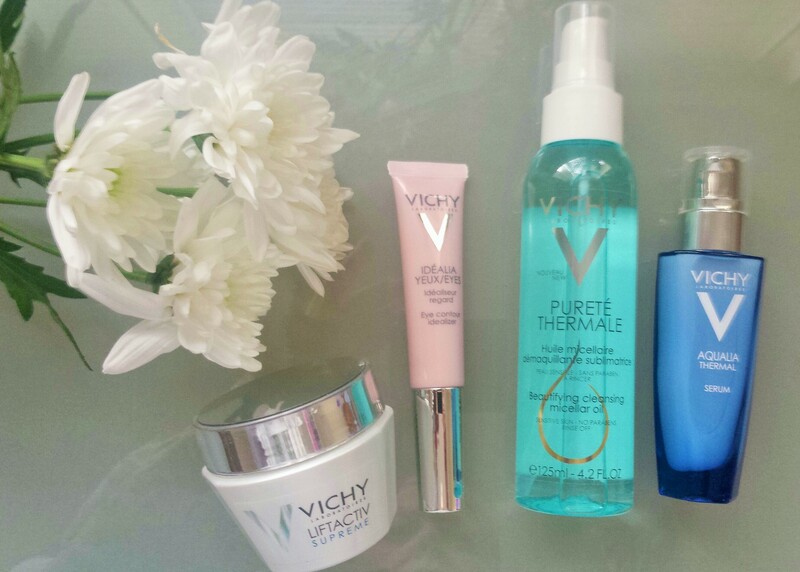 I’ve been re-acquainted with a couple of old favourites Vichy Aqualia Thermal and Vichy Idealia Eyes and am excited to be trying out Vichy Purete Thermale Beautifying Cleansing Micellar Oil and Vichy LiftActiv Supreme. Normally I’d try out products that are new to me for a couple of weeks so that I can give you an in-depth review before having my say but I just couldn’t wait to give you my first thoughts on these! If you know me at all I’m strongly influenced by how products look. This gorgeous blue oil reminds me of calm blue water. So even before I tried it I was kind of biased! When I pumped the oil into my hand to apply it I found that it was light and not too gloopy. I smoothed it on, focussing on the eye area where my most stubborn make-up usually sticks. It dissolved easily. When I applied water the oil emulsified into a milky wash and left my skin feeling clean, soft and not at all greasy after I removed it. Whoah! There’s an awful lot of claims in there! What attracted me most is the lifting effect – it’s in the name of the product after all. I don’t think my skin is doing too bad for it’s age but we can always do with a little lift – like you get when you use your fingers to check if you need a face lift! As I’ve said I can only give you first impressions so any thoughts on longer lasting effects will need to wait. I did feel that my skin felt plumped and firmer. And tiny wrinkles were a little blurred. So that was all good. I do want to say though, something that British Beauty Blogger has brought to my attention (Thanks Jane!) and that is that beauty products often focus on making you “look younger”. Is that what we want to do, look younger? Or do we just want to look beautiful and the best we can be? So I’d say, in relation to this product, it doesn’t need to make me look more “youthful”, but I think it does improve the tone and look of my skin, and that’s an achievement in itself. I’ll definitely report back on any more outcomes of use over time. You can find Vichy LiftActiv Supreme here priced £25.45. Are you trying out any new products this weekend that you can share furst thoughts on? I’d love to hear them.